Sean’s first real computer was an 8-bit Commodore 128, which was amazing in its day for running at a blistering 2MHz and having a full 0.5MB Ram Expansion Unit. Sean ran two paper routes for a year to save up enough money for that system, and spent far too many hours on early Bulletin Board Systems using a 2400 baud modem. Kids don’t know how good they’ve got it these days. The Commodore Amiga, the follow-up computer to the 128, cemented the role of the computer in Sean’s life. The 3D and audio capabilities of the machine were unprecedented, and until recently remained unrivaled. With multitasking, 4096 colours, and stereo sound and a brand-new 16-bit architecture, the Amiga was the template for what the modern PC has become (both on the Mac and Windows side). Long after moving on to the Mac as a business machine, the Amiga remained as the home computer of choice. The Macintosh II (and an early $6000 PostScript laser printer) was the first in a long series of Macs that Sean used, evolving through a bewildering array of processors from the 68020, 68030, 68040, PowerPC 601, PowerPC 604, G3, G4, G5, and the Intel Core 2 Duo and Core i7 chips. Each step forward increased the boundaries of what could be done, and the current 64-bit 15″ MacBook Pro is the machine that, for all of those developmental years, Sean really wanted. Sean has a working model of the Altair 8800, arguably the very first home computer. He has used models as diverse as PETs, IBM PC Juniors, ICONs, Timex Sinclairs, and the entire line of Macintosh computers (the very first 128K Macintosh was a marvel, but somewhat useless, while the 40MHz Quadra 840av was a real leap forward with its extra AT&T 3210 DSP which helped certain Photoshop operations really fly. Sean is entirely self taught, with an insatiable curiosity about the world, and an ability to figure things out by determining the right questions to ask. In the early days of computer graphics, there simply weren’t any courses available, and things changed so fast that few schools could have kept their curriculums up to date. He credits certain experiences and mentors as being instrumental in his development. Working for The Strategic Coach for 15 years, founder and president Dan Sullivan was instrumental in building up Sean’s design vocabulary. Sullivan, a classical designer, and Sean, already with many years of computing under his belt, made the perfect team for producing the visual materials for the formative years of The Strategic Coach and it’s iconic entrepreneurial programs. 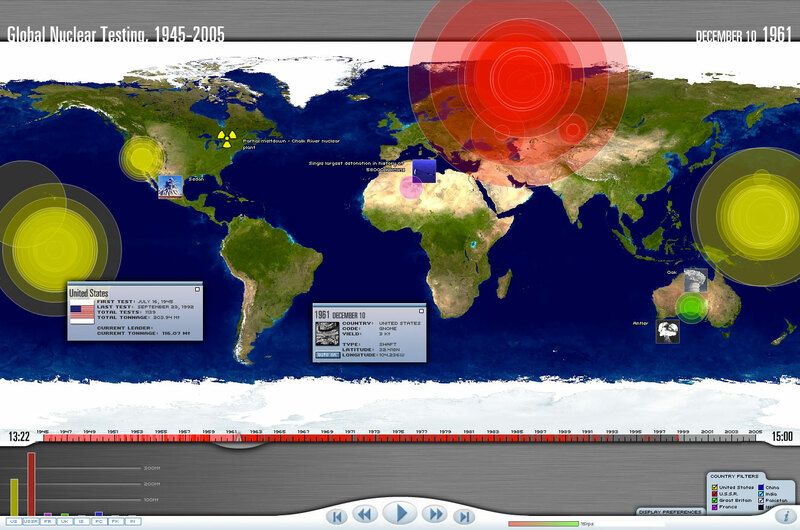 The interactive world came alive working with Integrated Communications and Entertainment (née Multiple Images), and such luminaries as Pete O’Neil, Stephen Beinicke, and Robert Johnson (now of DataWay Multimedia). Using early versions of Macromedia Director, Sean learned the ropes of large entertainment productions for companies like Zellers, Chrysler, and London Drugs, watching his work come alive on massive projection screens in front of large audiences. Above: Global Nuclear Testing, an early project to learn ActionScript. Sean’s programming experience dates back to grade school, with early courses in BASIC. Fast-forward a decade or so, and the appearance of MacroMedia Flash (now Adobe Flash, née FutureSplash Animator) suddenly breathed interactive life into his designs. Picking up O’Reilly Press books, Sean taught himself ActionScript, and developed Global Nuclear Testing 1945-2005 as a home-brew course to learn the ropes. Moving on to ActionScript 2, working with VisionMAX Inc., he developed the interfaces and logic for extremely data-heavy visual applications like Bell Canada’s VEPR client and Pizza Pizza’s point of sale system. 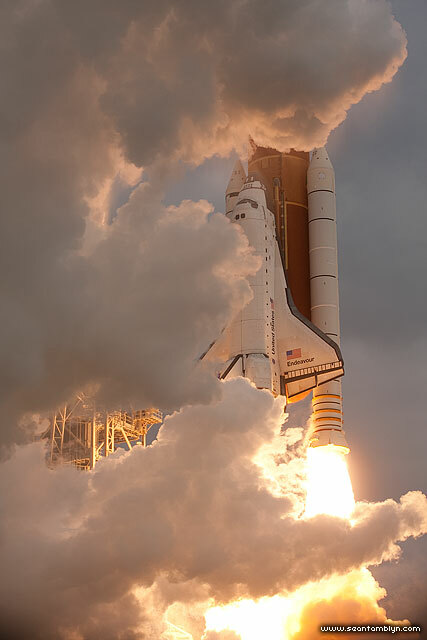 Above: wreathed in her own launch plume, space shuttle Endeavour (STS-134) lifts off for the last time. Sean is an avid cyclist, camper, and kayaker. He routinely does one or two week solo kayak tours through Georgian Bay, filling a hold in his kayak with camera gear to photograph the remotest locations on Canada’s Sixth Great Lake. In 2000, he toured across Canada by bicycle, an 8000Km epic that took three months, taking in the Rocky Mountains, the Prairies, Ontario, Quebec, and the Atlantic provinces. In 2008 he kayaked from Toronto, Ontario to Tadoussac, Quebec, a month-long odyssey from the fresh water of Lake Ontario through the St. Lawrence River to the salt water of the Gulf of St. Lawrence. It’s not every day that you leave your front door to paddle with Minke whales. He’s bicycle toured through Canada’s Gulf Islands, Cape Breton, and Italy and Sicily. He regularly canoes Algonquin Park, kayaks Georgian Bay, and paddles year-round through the Toronto Islands. He also visits Silent Lake provincial park every winter, and spends a few days under the full moon in a snow shrouded forest. Sean considers The Space Shuttle Project: Last Chance To See, photographing the final four space shuttle launches, to be his greatest adventure yet, but he’s not sure since it involved so much driving. 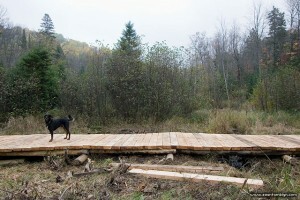 Above: Arthur surveys the fresh hemlock deck on the new Beaver Meadow boardwalk. 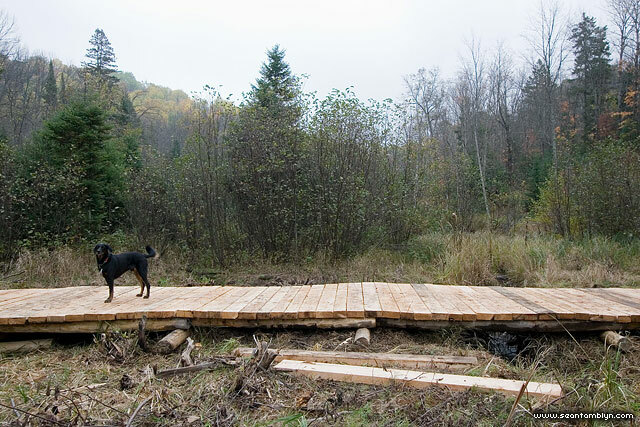 As lifelong campers, Sean and the members of the SP/AVLU really enjoyed giving something back to the park system that makes Ontario so special. * No squirrels were harmed during any SP/AVLU outing. This is a big one. It’s coming soon! 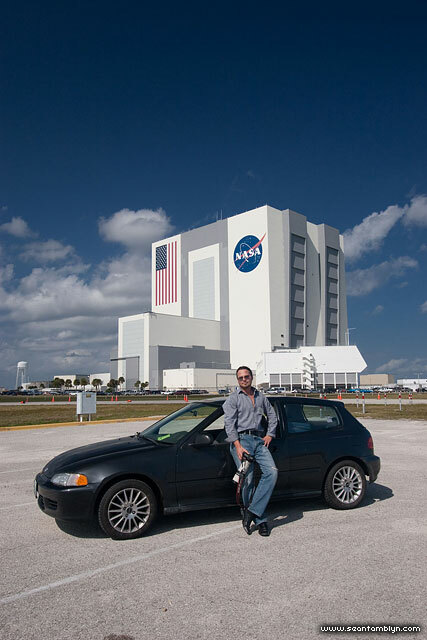 Above: Sean and his Mighty Civic in front of NASA's famed Vehicle Assembly Building. Sean currently lives on the Toronto Islands, in a house that once had a sweater knitted for it. 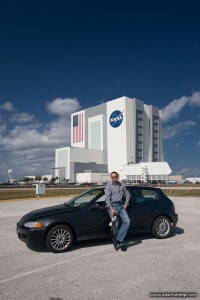 He still drives his first car, a 1993 Honda Civic, that he considers one of the best cars ever made. He has two cats that he adores to an unhealthy degree, and is currently, among other things, building infrared and underwater wildlife camera systems to photograph the more elusive denizens of Toronto’s wild areas.